Daleys Fruit Tree has Plants for Sale to Coombell and can Mail Order them to you door. Click to Find out how much Freight Will Cost. Known as emu apples or native cranberries this is a low growing shrub found on the south coast of Australia. 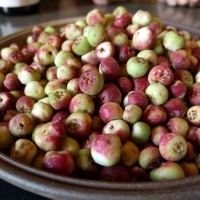 When ripe the berries are green with a red tinge and have the flavour of spicy apples. Muntries can be grown on a trellis to make the fruits easier to pick.